In August 2015, he shut down Osun state university, Osogbo Campus with the first edition of the comedy special; Laugh Under Nonstop Grace,having a turn out of over 500 people. 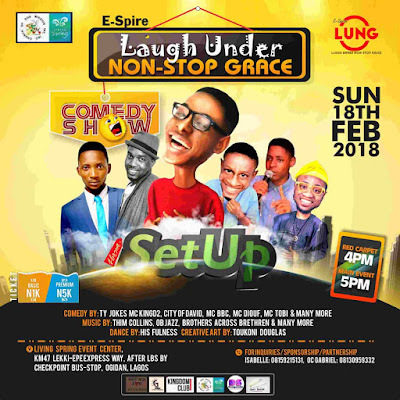 Oriazowan Emmanuel (E-spire), once more, is set to storm the city of Lagos, Lekki precisely, with the second edition of the Laugh Under NonStop Grace show tagged: "The Setup". 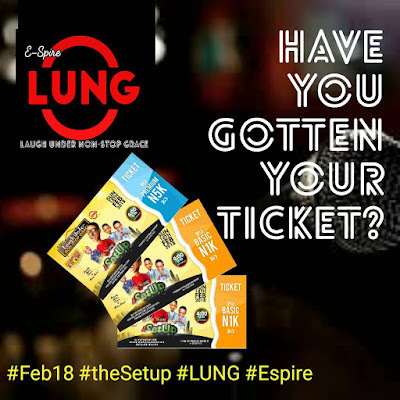 The show has been lined up with a list of seasoned comedian; TY Jokes, MC Diouf, City of David, MC BBC, MC D2king, MC Bishop, music performances by Thim Collins, John Bliss and OB Nelson. and wonderful hosts; Tughu, Grey, Daniel Roland, Sarah and Nyerhovwo! Are you ready to be setup??? Let's gooo! Venue: CGMi Living Springs Event Centre, Ogidan bustop, After LBS, Ajah, Lekki, Lagos State.